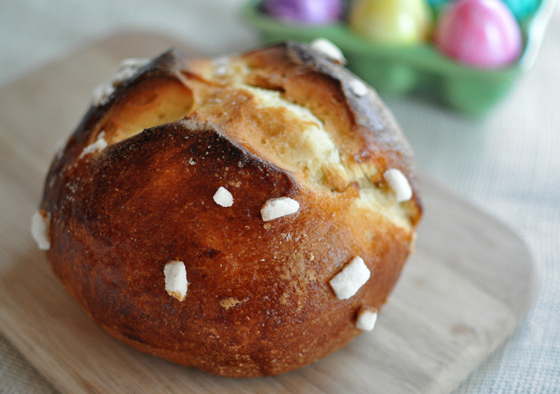 Ok, I'm late, I missed actual Easter, but I still want to share this beautiful Croatian Easter bread. Some people call it sirnica and some call it pinca. 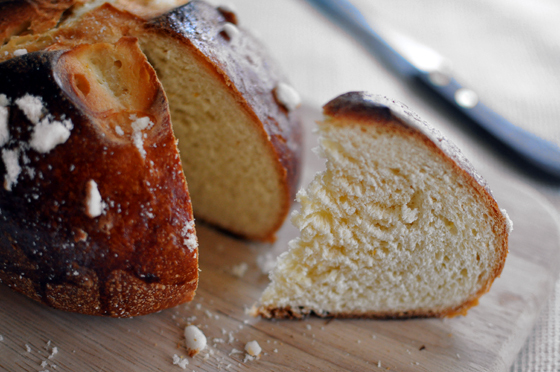 But to explain it in most simple way, it is aromatic sweet bread similar to a more dense brioche. 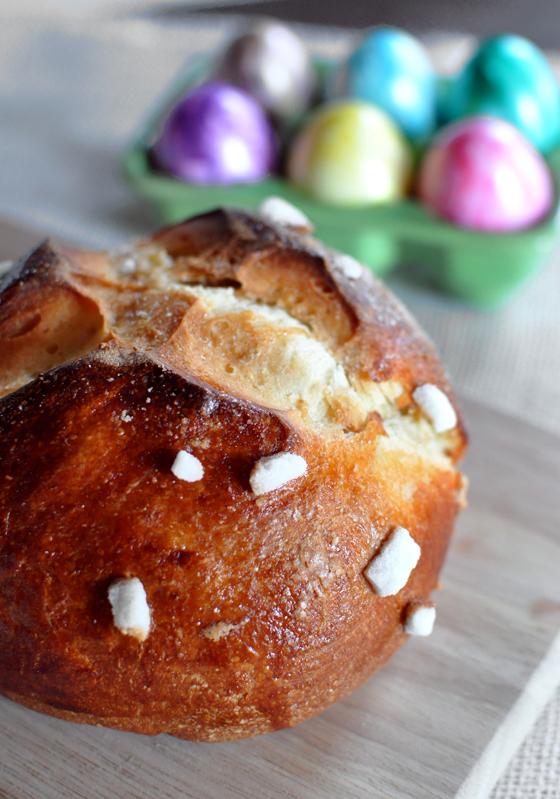 We eat it only around Easter and it is my favorite breakfast thing ever. OK, it shares the first spot with spice bagles, those two things are my favorite things to eat for breakfast. Just give me a warm cup of cocoa or coffee and it's bliss. I always say that this year I will make one or the other in the middle of the summer because I crave it so much, but I can't. It would be wrong. They are to be eaten at their designated holiday times and it would make them less special if I made it whenever I want to. I am weird like that. Mix the flour, yeast and pinch of salt in a stand up mixer. On a side, mix sugar with the eggs, all of the extracts and liqueur, melted butter and oil and peels of lemons and oranges. Add the egg mixture to the flour while mixing on medium and start adding milk. You want the dough to start forming a ball, don't put too much milk but you don't want it to be too dry or firm either, you kind of have to eyeball it. Beat with the bread attachment for about five minutes then take the dough out on a nicely floured surface. Knead for a minute and then put into a bowl and cover it with plastic wrap so it doesn't form crust. I warm my oven on the lowest setting 150 F, turn it off and then leave the doors open a little bit with the dough inside left to rise until it doubles in size. If you have a little lower setting it would be better and then you don't have to leave the oven open. You can certainly leave it outside in a warm spot to proof, but it will take longer. With the oven it takes about 1 1/2 to 2 hours, it is a 'heavy' dough. 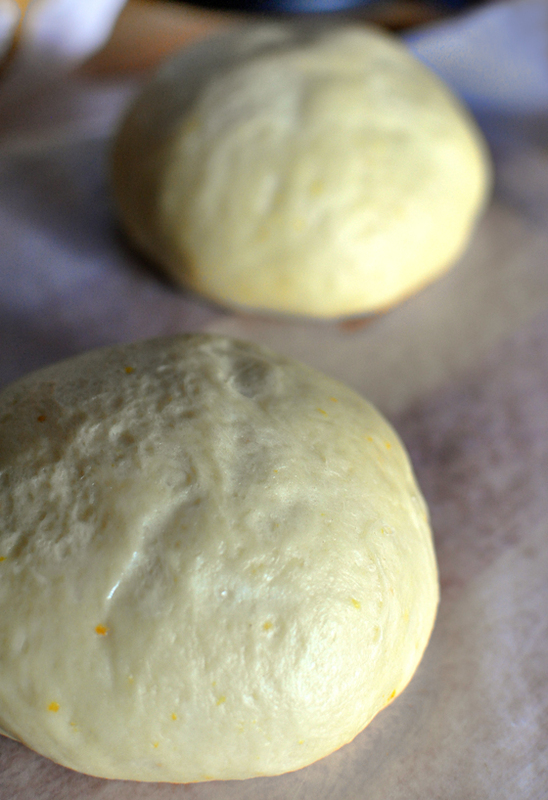 Once the dough is doubled in size divide it in 4 equal parts and form balls. Let them proof again for about half an hour in a like warm oven or a little bit longer outside. Half way through the last rising you will score the balls with scissors. Make a 3 star cut. When ready to bake, take your beaten egg and brush each ball on the outside, avoiding the insides of the scored areas. Then crush up roughly some of the sugar cubes and sprinkle on top. Bake for 30 to 40 minutes on 350. You want a nicely dark brown outside and lighter yellowish scored parts. 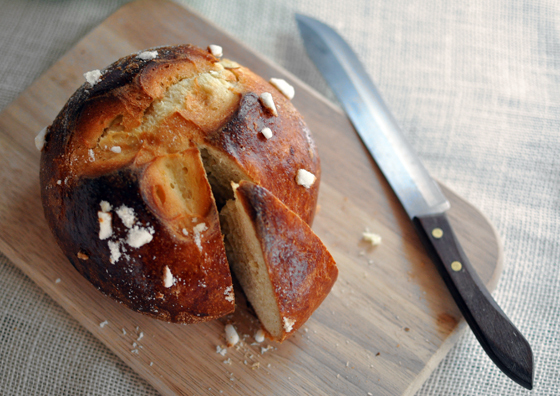 I love to eat hot breads even though many people say they should cool of first, this one I would agree on that, let it cool almost completely before trying it, it is best in the following days anyway.